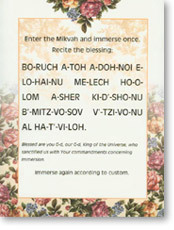 Decorative laminated chart of the blessing recited upon mikvah immersion. Transliterated from Hebrew to English. Includes English translation of the blessing.